On this flower journey, you need kind friends to encourage you, guide you, and lend a hand. The Team Flower Community is an online support network where floral professionals just like you can gather together! As busy flower pros, it can be tough to find the time to build a community of flower friends to lean on for feedback, encouragement, and growth. But with over 2,000 members made up of florists, farmers, artists, and industry pros from all over the globe, you’ll quickly find in the Team Flower Community that you’re not alone in your questions or struggles—or in celebrating your wins! Official Team Flower handwritten postcard via snail mail welcoming you personally to the community! Need a second pair of eyes to review your proposal? Looking for feedback on your latest design? You’ll find a safe, grace-filled space here to share your work. As a community with over 2,000 professionals across the globe, chances are someone has experienced the very problem you’re facing right now in your business. Members are always ready to lend a helping hand. 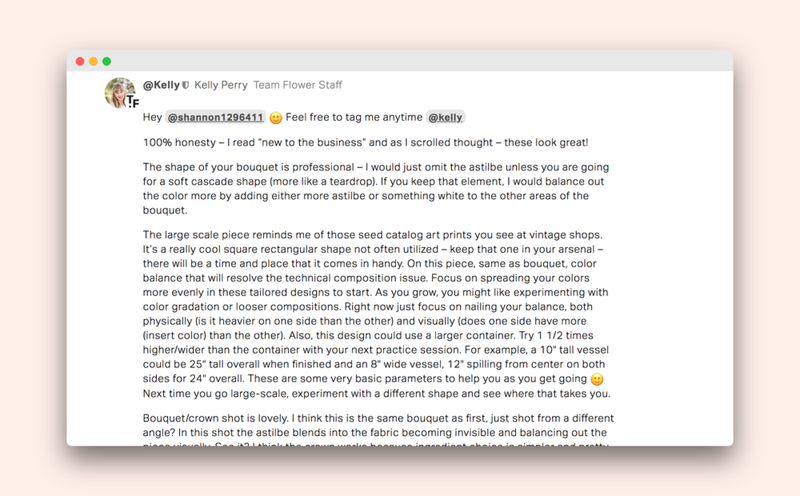 Discuss what you’re learning in your Team Flower online class with classmates. Easily search our existing database of conversation topics (1,800+ and growing!) and take note of anything that’ll help you on your journey. Move forward without worrying about recurring monthly fees—enjoy lifetime access to the Community after joining. Stop in when you can, and stay as long as you’d like! 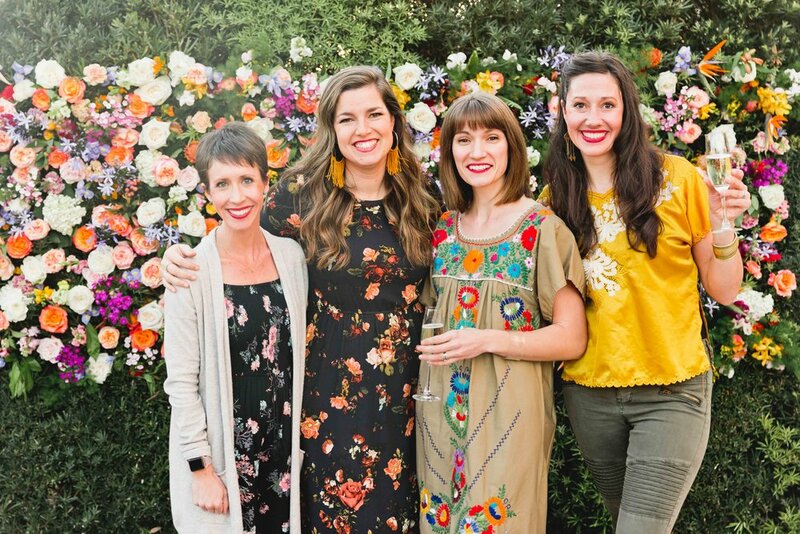 One of the most exciting features of being a Team Flower Community Member is the ability to build real, genuine friendships with other flower pros—and even connect away from your digital screen! Locate other kind and caring designers, farmers, retailers, artists, and wholesalers in your own backyard who love their work just as much as you do. Grab coffee with new flower friends, learn from one another, and even travel to the annual Team Flower Conference together if you like! Lori Tran is a designer in Virginia. She loves the seasonality of flowers and how that keeps floral design work interesting. If Lori could give her younger self business advice, she’d tell her to hire help sooner, learn to delegate, and not to take yourself too seriously. The most meaningful lesson she’s learned in working with flowers? “Accept that nature is the boss.” Since working with natural elements rarely goes exactly as planned, being able to pivot easily is important. She loves the Team Flower Community because she’s able to book talented freelance designers that have enabled her to take on bigger jobs. Bianca Rosen is a floral artist based in Montreal, Canada; her favorite clients are those who want wedding bouquets painted. What’s one thing she’d like other floral pros to know? “The beginning is always the hardest.” Work hard, and the benefits of hard work will pay off. While she’s most proud of being able to sell custom paintings, she’s honored when she gets to meet someone who “gets” her unique style. Bianca loves being able to do what she loves every day by creating original botanical artwork, and she joined the Team Flower Community because of the shared passion of the members: flowers! Lauren Wiebe is a floral designer based in Manitoba, Canada, who entered the floral industry already having a background in weddings—she loves being a part of a couple’s wedding day and helping to make it special. As far as her business goes, she’s most proud of “the growth I’ve been able to achieve year over year.” Go Lauren! What business advice would she give to her younger self? Don’t be afraid to tell people about your business, while no one likes a bragger, it’s okay to promote your work. Lauren loves being a part of the Team Flower Community because it supports people in all streams of the floral industry and at all experience levels. 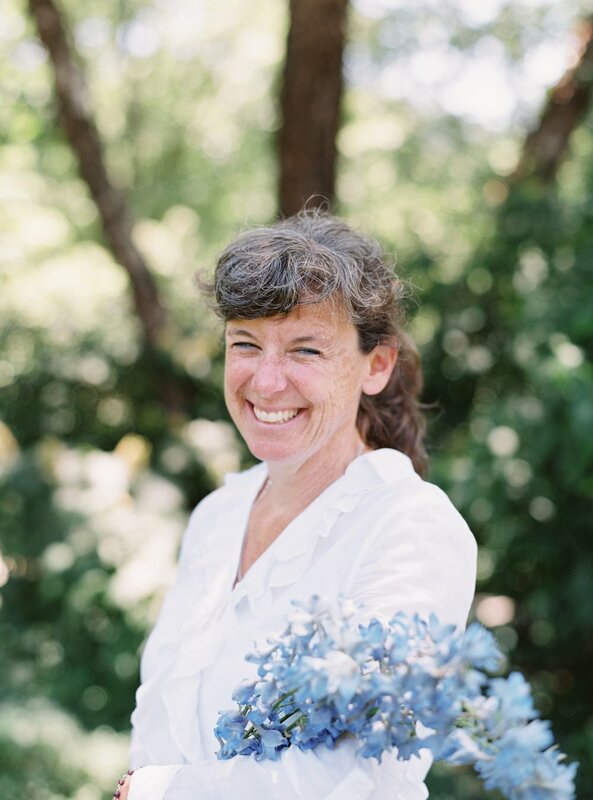 Kathleen is a jack-of-all trades and has been a part of the floral industry for almost 30 years in various roles—nursery owner, flower farmer, designer, gardener, and more! About her role in the floral industry, she says “I never take myself too seriously. I am just very happily creating beauty in my little corner of the world.” Kathleen loves growing flowers and the fact that no two seasons are the same. She enjoys teaching others about the joy of growing flowers (you can learn from her in the Foundations for Growing Cut Flowers class! ), and she would advise her younger self to be more confident in her pricing. Kathleen’s favorite thing about Team Flower? Having access to a network of talented floral pros who are ready and willing to share their expertise. Adrienne Rolon is a wedding planner and floral designer based in Chesapeake, Virginia. She loves how working with flowers fuels her creative fire, and she loves to celebrate weddings! Giving the bouquet to the bride on her wedding day is her favorite part. As far as business advice goes, Adrienne would say change is essential to growth. The most meaningful lesson Adrienne’s learned through flowers? Plan ahead! There are so many moving parts, and sometimes you have to be flexible and “move and shake” if you need to. 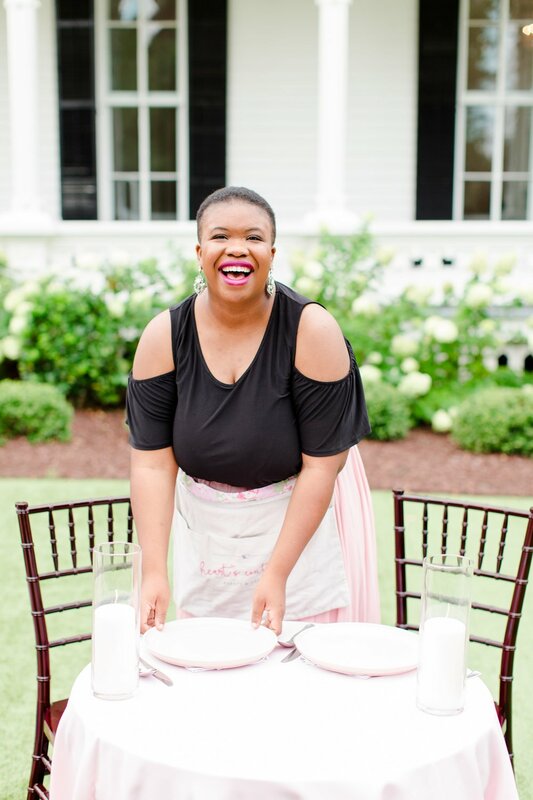 She’s most proud of finding joy in the process of owning and running her own business, and she loves the sense of community Team Flower provides—so many other floral pros are willing to share their knowledge and assist one another with “smarts and heart,” as she likes to put it! It’s more than a Facebook group! 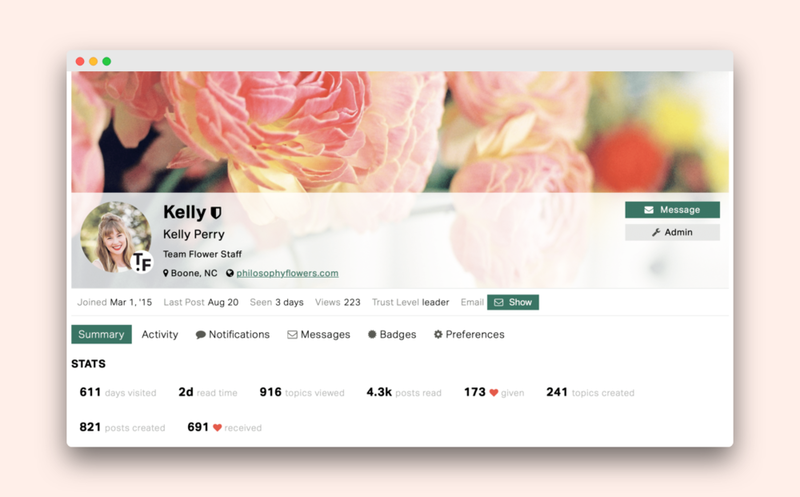 The Team Flower Community platform offers you a private, secure place to connect with members, take classes, and be a part of an exclusive directory of floral pros accessible to prospective clients—all in one place. Search through past conversation topics with ease (unlike a Facebook group) and receive a monthly newsletter of the best topics covered. Jump right into the areas that interest you! Designing: Share tips and ask questions about designing arrangements. Business Topics: Everything about the business-side of things—proposal pricing, marketing, client acquisition, and more. Growing flowers: Discuss growing flowers, ask questions, and share best practices for starting or improving a thriving farm. Tips and Resources: Got a new technique, trick, or method you’ve learned that you want to tell others about? Or share any resources that are helpful to you! Flower Care: All about the care, maintenance, and upkeep of flowers. Online Classes: Interact with others in your Team Flower online classes. Connect with the instructor, ask questions, and share your projects as you work through the lessons. Problem Solving: Need help from the Community? Tell us your problem, and let’s solve it together! And more: Delivery and installation, retail environments, sourcing hard goods, identifying new flower varieties—the list goes on! 1. Join an online class: When you join a class, you’re automatically enrolled and gain access to the Team Flower Community for FREE! 2. Attend an in-person event: When you attend a Team Flower in-person event, your membership to the Community is included at no extra charge! 3. Purchase a lifetime membership standalone: Want access to the membership only? You can have that too! For the one-time membership fee of $149, you get lifetime access to the Team Flower Community without joining a class or in-person event.